To those who would accept a cup of hot chocolate, we declared that it would be a prophetic act of receiving the love of God. We got to know them and asked if they wanted prayer. Many wished for a better life or a good life. One woman named Nina, who was born and raised in the area, was looking for happiness — “something that money can’t buy.” She said “they tried to get her to leave” but she had nowhere else to go. As we were praying, a man of prayer named Chong who lived in the neighborhood and who was filled with God’s Spirit, began to bless each one of us in Jesus’ name. He prayed for a woman walking by and she began to weep, expressing joy on her face. I felt in my heart that God sent him to show us that He is here with us. We saw a man named Troy, intoxicated and taking up most of the sidewalk with his possessions. After we laid our hands and prayed for him, he said with clarity “that was powerful!” We witnessed the power of God breaking down strongholds and setting the captives free even in the midst of their daily struggles. On our final day, a man named Vernon, who often spends his time on the block of Ellis Street where the YWAM building was located, came to our spaghetti lunch and sat at our table. He had a lot of pain and began to weep for all the friends who died in his life from drugs. He shared loving memories of his family’s thousand acre farm where he helped out. His parents died about three years ago and left everything to his sister in Kansas City. He still has a lot of deep emotions of bitterness, anger and pain. Though he refused our offer to pray for him, our team declared that those entering into the YWAM building for lunch would not only be fed physically, but that it would be a prophetic act of entering into the feast that the Lord has prepared for them. 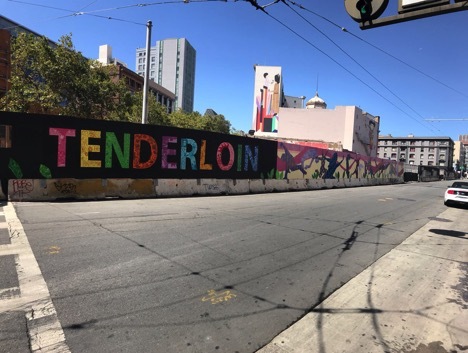 Even though we saw the struggles in the Tenderloin — the district seen as the geographical heart of San Francisco — in our prayer, God showed me how people throughout the city are walking away from Him. Certain sins of violence or sexual immorality might be readily visible but the sins of pride and greed in the heart are not so easily seen. That we ourselves are no different from the people we met: we search for a good life outside of God’s Truth. We are addicted to things like media or entertainment that bring death, not life. We have anger and bitterness buried deep in our hearts. We struggle with sexual immorality and violence. We have made poor decisions and are suffering painful consequences. In the midst of darkness, God’s light shines and He wants to bless us. As I reflected, I received an image of Jesus walking along Ellis Street. Jesus is walking among us, calling all those who want to receive from Him a life that only He can give — a transformed life of freedom and of hope.